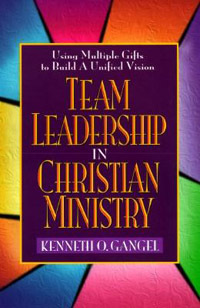 Developing Ministry Teams is quick summary of the principles of an effective team, the steps in team building and the examples of team leadership. Van Auken explains, "Christian ministry is teamwork with a difference, teamwork that makes a difference. This is because Christians are different in the goals they pursue and in the way they pursue them. God intends for His family members to work together in unified cooperation, the very essence of teamwork." Van Auken went on to explain why Christian ministry is teamwork with a difference. Christian ministry is teamwork because of the pervasive sense of family, because personal sacrifice is elevated above individualism and self-serving competitiveness, because followers are just as important as leaders and because God is in the driver's seat. After all, He charts the ultimate course. If Christian ministry is teamwork with a difference, what are some things we need to know? Effective Teams Understand Team Goals - It is very important that members of a ministry team understand their corporate goals. If they do not, then they cannot successfully move toward them. Effective Teams Utilize Group Decision Making - In years past, groups discussed and leaders made decisions. However, times are changing where group decision making is becoming more prevalent in churches and organizations. Effective Teams Share Leadership Responsibility - Ministry teams that share leadership responsibility function as one. They recognize their corporate function rather than their competitive function. They anticipate what God will do to honor their commitment, their work and their prayers for each other. Effective Teams Maintain Good Communication - Communication is something that all team members but work at all the time, not just in meetings but also between meetings. In other words, effective teams know how to communicate with all members of the team. Effective Teams Evaluate Process as Well as Product - Product describes the outcome. Process describes the path taken to get the product. Reflection and evaluation of process and product is absolutely necessary for effective team ministry. Teach Effective Leadership - Leaders are not born; they are made. Jesus selected twelve men and taught them to be a team. Build Team Unity - This is crucial for ministry teams. It is foolish to enter into a project if the team is squabbling and backbiting. Effective ministry teams work together and support each other. Make Use of Team Abilities - All team members bring different gifts, talents, experiences and skills to a team. A good team leader utilizes the abilities of team members to get the job done. Practice Mutual Submission - There is strength in servant leadership. Jesus demonstrated servant leadership and God calls his people to servant leadership. Teach People to Follow Creatively - Followership precedes leadership. Learn followership and you will become a great leader. Selection of Servants in Acts 6:1-7 - In this passage of Scripture, we find that there was a neglect of congregational care. So the apostles transferred the whole project over to those who faced the problem on the front line. They formed a ministry team and gave them the responsibility of meeting the needs of the widows. The Antioch Church in Acts 11:19-30 - A church formed on the run and led by Barnabas became its own ministry team when it collected an offering for famine relief in Judea. They studied God's word together and took care of each other and in the process became a ministry team. Sending of the First Missionaries in Acts 13:1-4 - The Antioch Church became a large ministry team and gave birth to a smaller ministry team by picking and sending missionaries. The Council at Jerusalem in Acts 15 - The Jerusalem council was a ministry team. They made decisions together in order to formulate policy for the Gentile churches. For more information about this subject, click on Developing Ministry Teams. Free Topical Sermons: Free Topical Sermons help you understand what is a topical sermon and how to write a topical sermon. Hermeneutics: Hermeneutics is a set of principles that is used to determine the meaning of the biblical text under investigation. Understanding hermeneutics is paramount in developing a consistency in the interpretation of Scripture. Homiletics: Homiletics is the art of preaching. It involves how to prepare and deliver a sermon. Topical Sermon Outlines: Topical Sermon Outlines explain how to create sermon outlines so that you can preach topical sermons to your congregation.